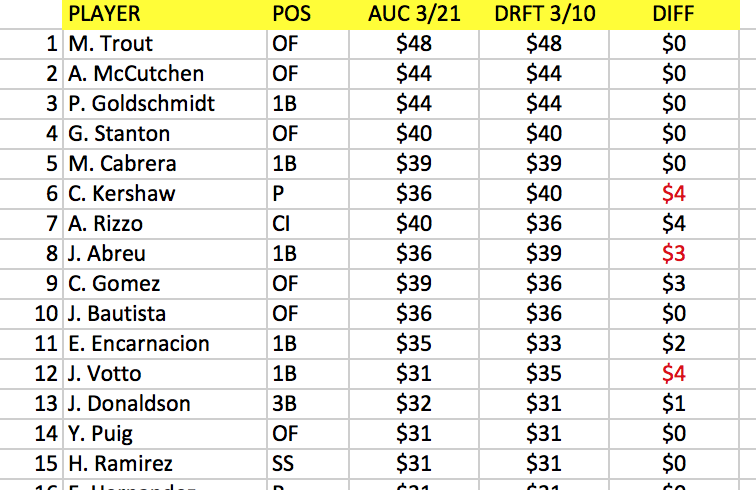 ← How Much A Difference Does Moving From BA to OBP Make? 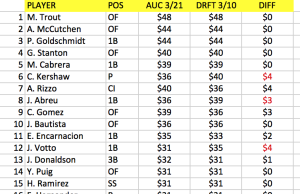 If you order the auction dollar values from most expensive to least expensive, then overlay them on the player selection order in a draft, you get a dollar value for each draft pick. That’s what I’ve done with this year’s Tout Wars Mixed Draft (March 10) and Auction (March 21). Both use the exact same rules, though the roster of owners is different and 11 days of news can make a difference. When the drafters selected Chris Sale, as a $22 player, he had just sprained his ankle and no one really knew what was happening. Eleven days later not much has changed, except that he’s starting his rehab and is on the schedule originally predicted. Boing! Up comes his price. When I first did this exercise last year my goal was to explore how position scarcity might be greater in a draft, because I thought it might be, but if there is a spike in value at scarce positions it is overall fairly minor. Jose Reyes and Ian Kinsler and Jonathan Lucroy went much cheaper in the auction than the draft, but so did Adam Jones and Todd Frazier. All hitting lost value in the auction, and pitching gained it, interestingly enough. What I find striking really, is that the two lists vary the way two auctions might vary, based on the preferences of the owners and when players were nominated. This entry was posted in Auction, Data, Draft, Looking Back, Prices. Bookmark the permalink.